Castle Publishing has some great Christmas gift ideas from the Castle Premier Classics range – superb holiday reading. And even better, from now until Christmas, we’re running super specials on some of these books. 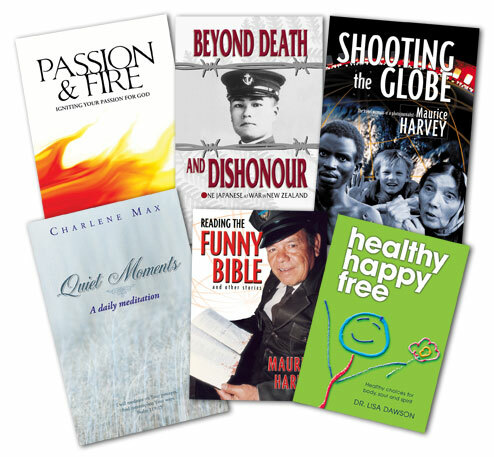 Contact us to order your Christmas gifts or New Zealand customers can visit their local Christian bookshop. Passion & Fire by Nathan Shaw. NZ$24.95 now NZ$19.95! Ignite your passion for God. Nathan Shaw explores the depth and intimacy of a fiery relationship with God and inspires us to go deeper into that relationship. Revitalise your Christian life. Beyond Death and Dishonour by Michiharu Shinya. NZ$24.95 now NZ$19.95! The incredible firsthand story of a Japanese naval lieutenant captured off the coast of Guadalcanal during WW2 and sent to a POW camp in New Zealand. He faces turbulent struggles in himself and in the camp, before finding God and being changed forever. A true classic. Shooting the Globe by Maurice Harvey. NZ$29.95 now NZ$19.95! The exciting memoirs of former Bible Society photojournalist Maurice Harvey. Shooting the Globe takes us through the aftermath of the Bosnian War, the Rwandan Massacre and to some of the most remote places in the world. Gripping and poignant reading. Illustrated with Maurice’s stunning photographs. Quiet Moments by Charlene Max. NZ$24.95 now NZ$19.95! A devotional written especially to help women find peace and rest with God in the busyness of life. There’s no better time than the Christmas holidays to escape the stress of life and encounter the gentle peace of God. Insightful, humourous and easy to read. Reading the Funny Bible and other stories by Maurice Harvey. NZ$16.95 now NZ$14.95! A collection of stories by former Bible Society photojournalist Maurice Harvey about people from around the world who became Christians by reading the Bible. Exciting reading, this book demonstrates the power of God’s Word to transform lives. Healthy, Happy, Free by Dr Lisa Dawson. NZ$12.95 now NZ$9.95! This booklet is a great handbook for you and your family. Dr Lisa Dawson explains in easy to follow steps how we can gain physical, emotional and spiritual health – what better way to start 2009? Recharge your batteries with this excellent guide that covers everything from diet to devotion by a fully qualified GP and mother of four. Contact us for more info or visit your local Christian bookshop today! Posted by Andrew Killick (Publishing Manager) in 2. Author Interviews, 36 Questions, 4. Castle Distributed Books, Geoff Vause. How did you come to write 36 Questions? It was inspired when my daughter’s boyfriend called to ask for my blessing on their engagement. At the suggestion of Rawiri who mentors pre-marriage relationships, we sent a questionnaire. It was so well received by our daughter, her boyfriend and their friends that we realised there was a demand. So 36 Questions came about, with international photographer Frank Habicht, a personal friend, graciously allowing us to use his work to add to the design of the books. Very enjoyable with Rawiri. I have attempted it in the past with a screenplay on one occasion and with a novel on another. There was no final result in both those cases. For some reason Rawiri and I mesh extremely well. I find him inspirational; he finds I can sharpen the focus for him in the written word. Rawiri is a speaker, I am a writer. It works. We hope to do more. Tell us more about the images in the books. I was looking for something that complemented the narrative but did not impose on it. I wanted black and white photography, I wanted humour and a slightly quizzical, even odd, parallel from the images. Something evocative. Frank’s work is excellent. Sahna Thomson (another daughter of mine) shot images to fill gaps and lean the idea a little closer to the narrative. How have the books been received so far? We have had an amazing response. We are seeing the books used, so we can see them subjected to real people and specific relationships. We notice that many parents are giving them to the young people in their lives. What is the biggest challenge facing people about to get married? Getting practical things in place despite the fog of passion. One is usually better at this than the other. Sharing the responsibility for their future and laying a foundation that helps that happen. What do you think is the number one thing that will help a marriage last? Communication and friendship. That’s two things. The ability in the couple to LISTEN to each other. It takes work. Of the 36 Questions, what is the most important one? That will vary for different people. For me, the most important question posed by the books is ‘will you read this book and answer the questions as honestly as possible?’ If the other party can’t or won’t do that, then you have a key issue right there. Do you have plans for any more books like this? Yes. We are allowing these books, which are also delivered as seminars by Rawiri Love, to ‘grow’ the next idea. What is your ultimate dream for this book? Acceptance by a wide cross-section of people at the early stage of relationship building, and having the books impact on their ability to talk and listen to each other. Do you have a quick piece of advice for someone about to get married? Don’t! Perhaps I should qualify that. Have a look at who you really are, and who your partner really is. Take a cold shower. Take another cold shower. TALK to each other. LISTEN to each other. Make your entry into the marriage covenant as deliberate and careful as possible. Listen to parental advice and mentoring advice. For older couples, have a very clear look at the extra baggage you carry. Above all – be honest with yourself and each other. To enquire about 36 Questions, or to order copies, please contact us.